Static site generators focus on one main task: generate a complete static HTML-based site. This result does not rely on databases or other external data sources and therewith avoid any server-side processing when accessing the website. In comparison to dynamic websites, static sites have many advantages and therefore are becoming more and more popular. Static sites can be served quickly, they offer a great extend of simplicity and comes with security benefits out of the box. Furthermore it’s easy to deploy and host static sites as there are no special requirements which needs to be covered by your hosting provider. Based on your background and preferences you’re able to select from a long list of static site generators. 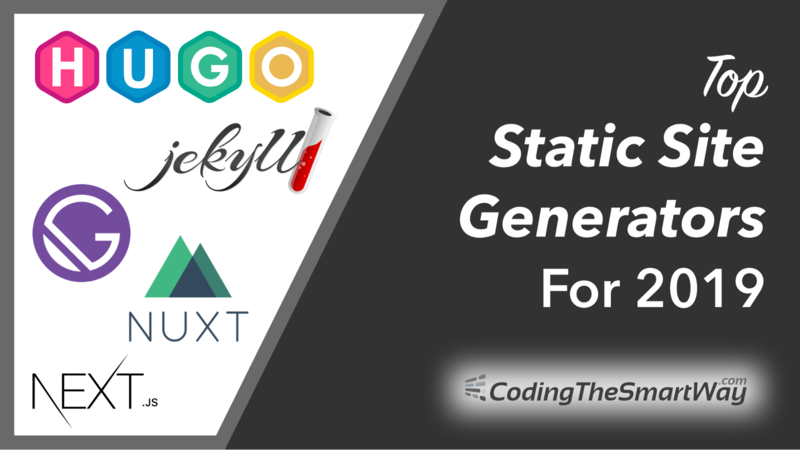 In the following you’ll find an overview of my top 5 static site generators for 2019: Next.js, Nuxt, Gatsby, Jekyll and Hugo! Under the hood we use webpack with vue-loader and babel-loader to bundle, code-split and minify your code. 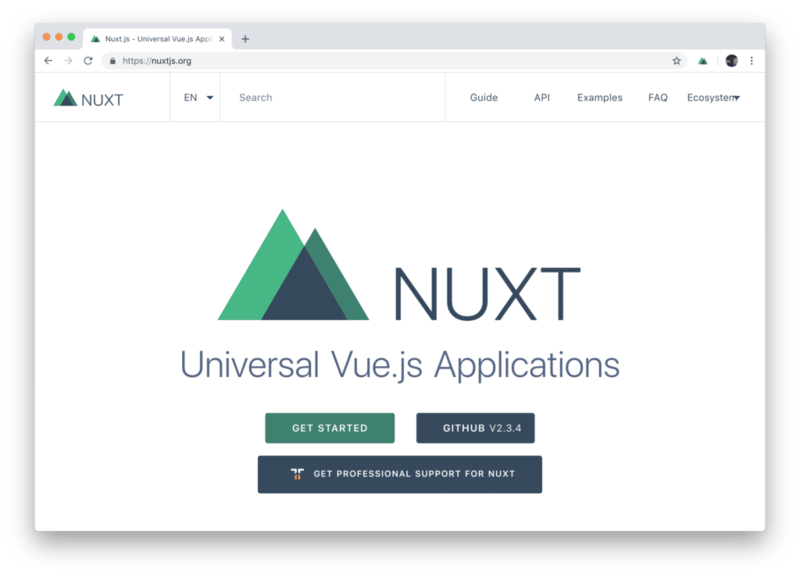 If you’re already familiar with Vue.js and now would like to dive into server-side rendering and the generation of static pages from your Vue.js application the Nuxt.js framework is definitely your choice. Build highly engaging Vue JS apps with Nuxt.js. 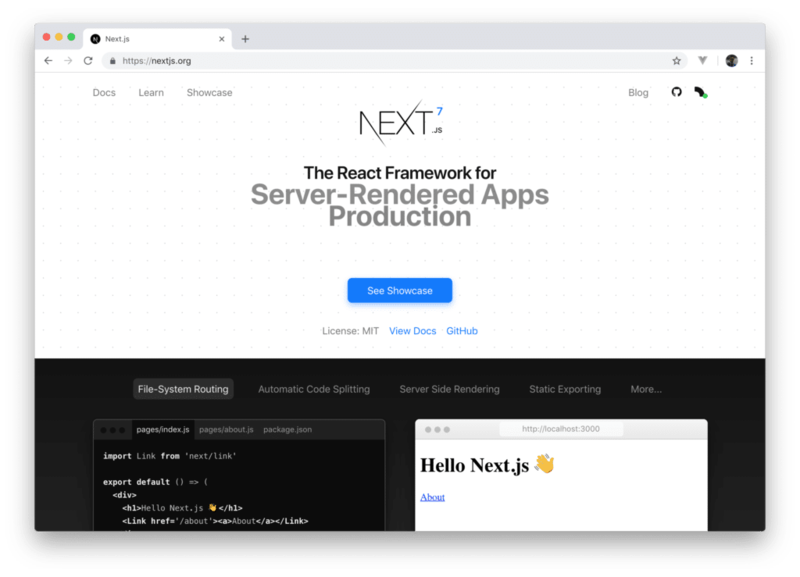 Nuxt adds easy server-side-rendering and a folder-based config approach. 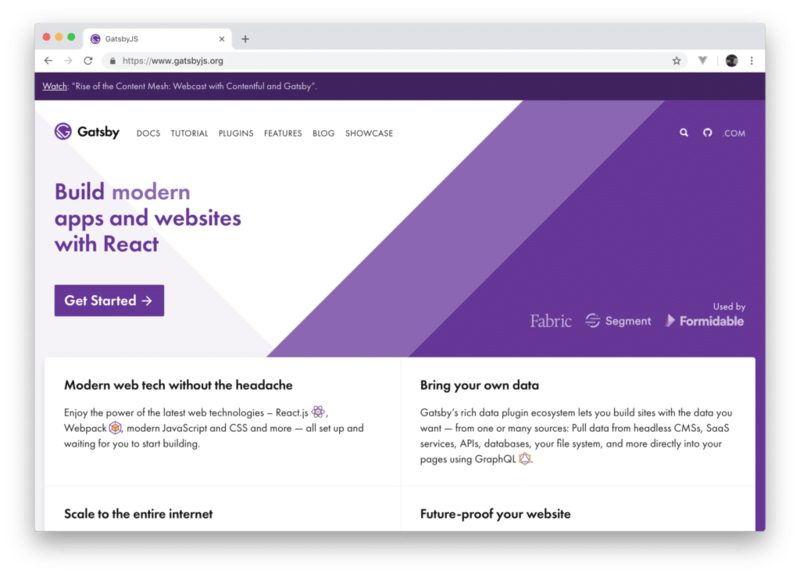 Gatsby is based and React and GraphQL, so if you’re already have some basic understanding of those technologies Gatsby might be the right choice for you. Maybe you’d ask: Why needs a static site generator GraphQL? The answer here is easy: Gatsby uses GraphQL internally to make data available which is pulled from different sources into your project. E.g. you can use sources like your file system, WordPress, or Contentful. All of the data which is made available from those sources can then be accessed by using GraphQL which makes the way you’re accessing data easy and consistent. Gatsby is optimised for speed. Gatsby tries to build the fatest possible website, it delivers code and data splitting out-of-the-box. Therewith Gatsby loads only the parts of your website which are needed right now. In addition, Gatsby prefetches resources for other pages. Because of that navigating between pages of your website feels incredibly fast. Gatsby comes also with a plugin system which makes it easy to extend the static site generator which additional functionality. E.g. if you want to pull data from another source you simply need to find the right plugin, install and configure this plugin and the desired data becomes accessible by using GraphQL in your pages. You will need to have a solid grasp of JS, React, and GraphQL in order to get going with Gatsby. Jekyll is a a static site generator which is available since 2009 and is build based on top of Ruby. Jekyll is also the engine behind GitHub Pages. GitHub Pages are public web pages for users, organizations, and repositories, that are freely hosted on GitHub’s github.io domain or on a custom domain name of your choice. The fact that Jekyll is powering GitHub Pages is also the reason why Jekyll is the most popular static site generator right now. Jekyll works very well with GitHub Pages which makes it extremly easy to get your Jekyll site hosted. Jekyll is easy to learn and in general comes with a great simplicity in it’s core concepts. Jekyll has a huge community, so it’s easy to find help to any topic related to Jekyll. If you want to extend the standard functionality of Jekyll you can make use of a long list of available plugins. Jekyll is based on Ruby. That means that you have to set up your Ruby development environment to make use of Jekyll first. As Ruby is not included in the top trending programming languages for web development in 2019 you might find Jekyll a little bit outdated. 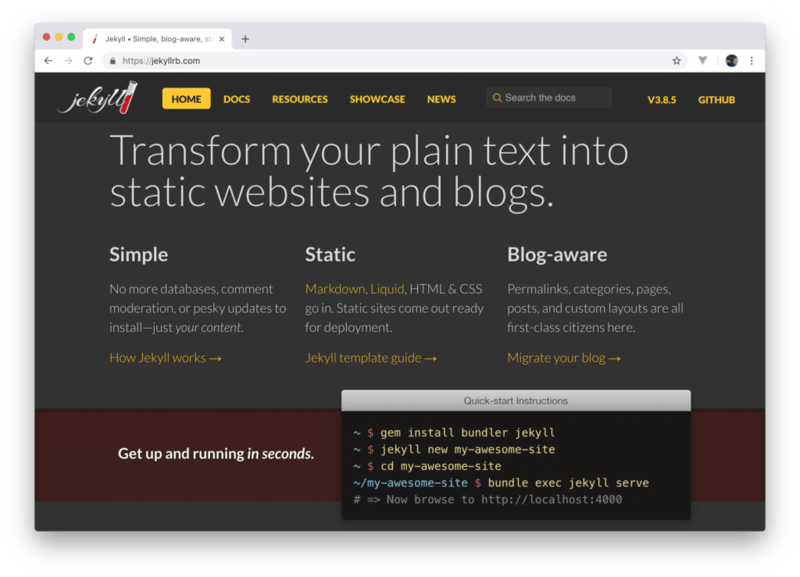 Jekyll: make fast, secure static sites and blogs with Jekyll. Do you want a clean, simple, fast and secure site or a blog and host it free on Github? Jekyll is the best way to go. Hugo is a static site generator which is also very popular which is proven by over 30,000 stars on GitHub right now. Hugo is based on the Go programming language which is great if you have already gained some knowledge of Go. 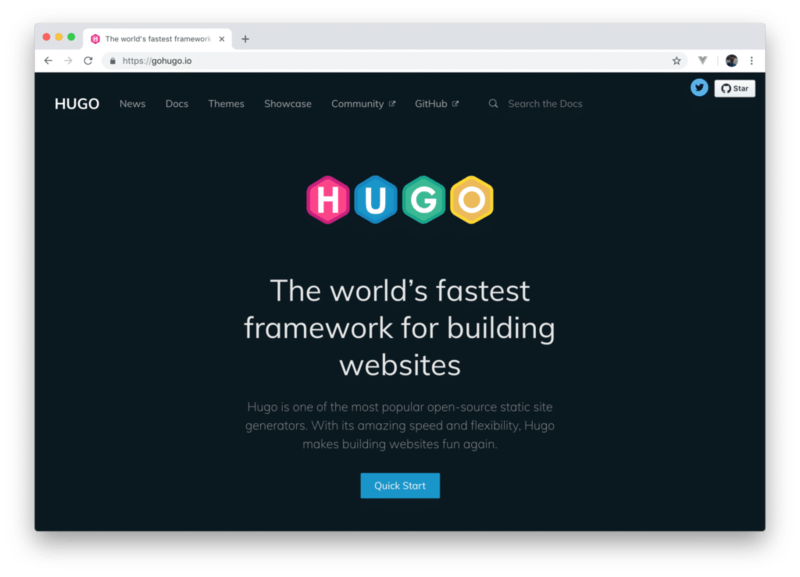 Hugo claims that it is the fastest framework for building websites. In fact Hugo comes with an ultra-fast build process and makes building static websites a breeze. Hugo has a theming system and a theme library which is comprising more than hundred themes which can be used to build you own website. You need to have a basic understanding of the Go programming language which is not so common in web development right now. Static side generators gain more and more popularity across the internet. If you’re trying to find the right static site generator for your use case and your technical background the list of available options seems to be overwhelming at first sight. This post has given you insights in five static site generators which are about to play in important role in the upcoming year. If you’re still unsure which static site generator to use for your upcoming project just give it a try, download it and try to implement a first simple example. Have much fun! Disclaimer: This post contains affiliate links, which means that if you click on one of the product links, I’ll receive a small commission. This helps support this blog! CodingTheSmartWay.com is a blog about latest web and mobile technologies.